For this Saturday’s dinner I found a couple of cute ideas on Martha Stewart’s website that promised to be a hit with the kids. The key for our Saturday dinners is not just that the kids will love eating them but that they will love making them. This week was all about getting messy. Our main course was Mini-Turkey Burgers. They were very yummy, very easy to make, and the perfect size for tiny hands. I thought it would be fun for the girls to get their hands in the mixture and make the burgers themselves but they were too worried about getting their hands messy. 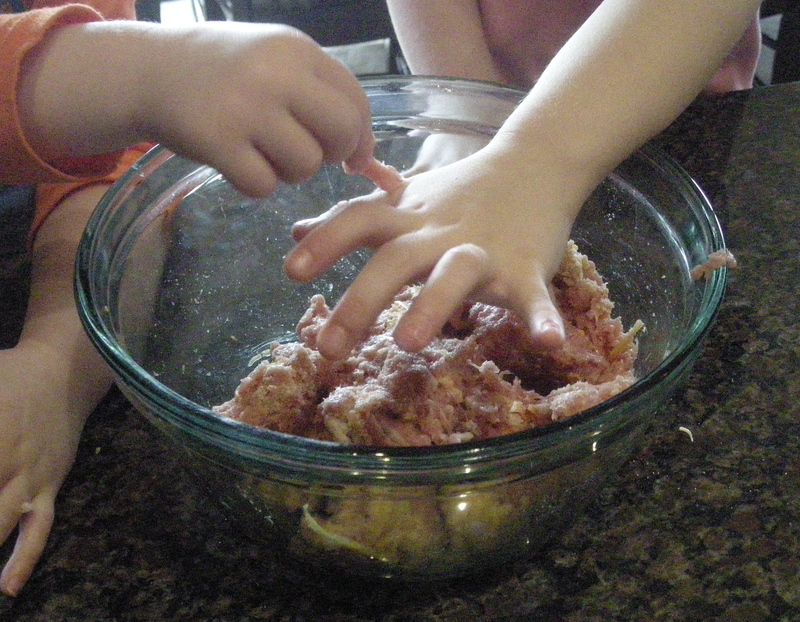 Whenever cooking with kids make sure they wash their hands before and after touching anything. This isn’t usually a problem in our house, the problem is usually the bathroom flooding! The only thing difficult to find in this recipe was the mini buns. 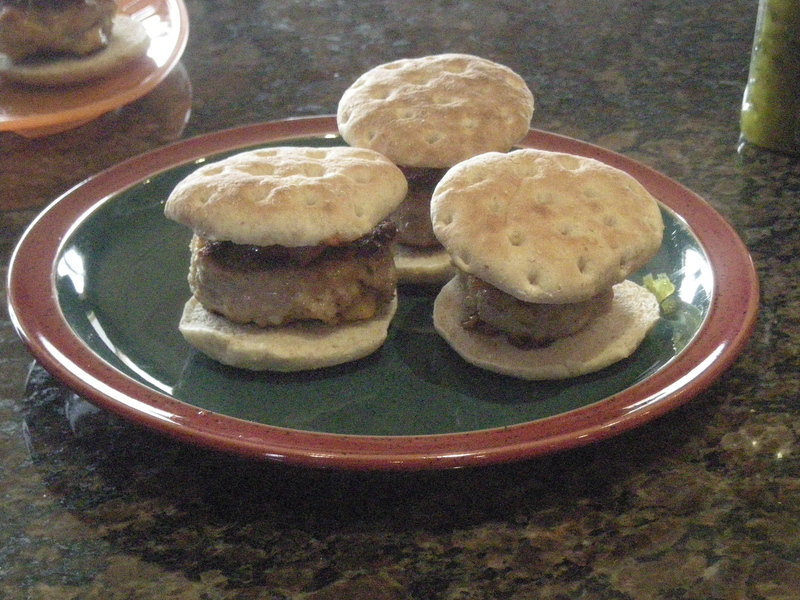 Gramma came to the rescue again and found Slider Thins Mini Burger Buns made by President’s Choice. It was nice having thin buns as we could make our burgers a bit thicker an they were still not too large for little mouths. My girls belive that dessert is a requirement at every meal. The key is to give them healthier options so they don’t end up with chocolate pudding or something out of the treat bowl. 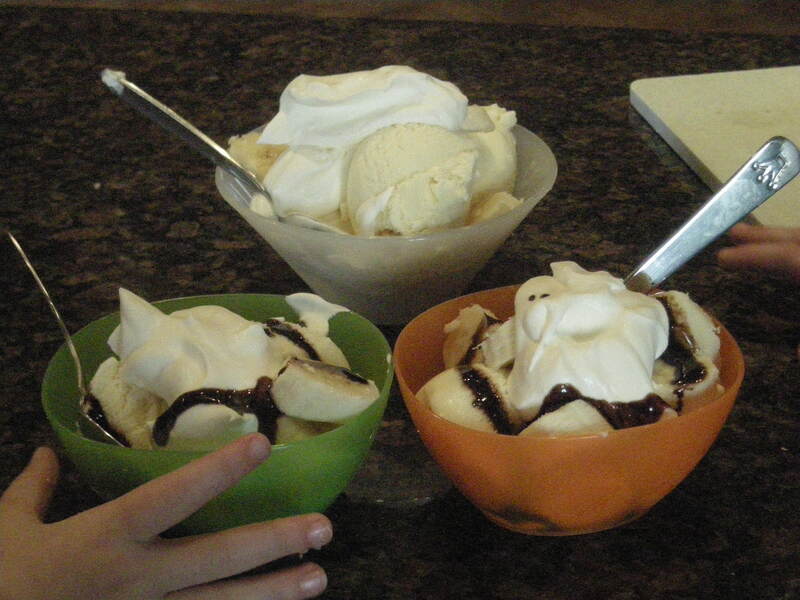 Today we made Mini Banana Splits. We used french vanilla frozen yogurt but you could use any flavour. I cut up the banana for them but they assembled everything themselves. We only added bananas but you could add whatever fruit you have in the fridge and your kids love. As a special treat they each got a squirt of chocolate sauce on their sundae! 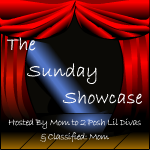 As always I am always looking for great cooking ideas with the kiddies so please offer your suggestions in the comments!